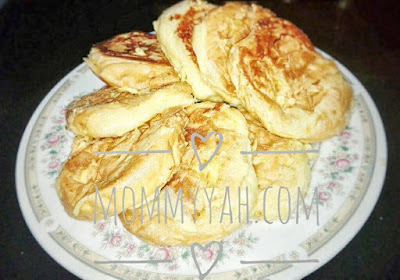 This recipe is my kids' most requested breakfast and baon to school too. It is not the usual toast that we eat as I used buns instead of sliced bread. Buns are thicker and heavier in tummy compared to bread slices so I use it to make toast in order to make my kids full enough to give them energy for the next 4 hours. Unlike the usual french toast, I use powdered milk instead of condensed milk as my kids find it creamier and more delicious. this recipe could only cost 50 pesos and it can make 6 buns toasts. I named this recipe as "Filipino style French toast"
Dip the buns and leave. It will absorb the mixture.